To translate this website from English into your local language use the control in the upper right corner of the web page. Para traducir este sitio web desde el inglés a su idioma local, use el control en la esquina superior derecha de la página web. Um diese Webseite aus dem Englischen in Ihre lokale Sprache zu übersetzen, benutzen Sie das Kontrollkästchen in der oberen rechten Ecke der Webseite. Kääntää tämän sivuston Englanti osaksi paikalliselle kielelle käytä säädin oikeassa yläkulmassa sivun. Pour traduire ce site Web de l'anglais vers votre langue locale, utilisez le contrôle dans le coin supérieur droit de la page Web. Per tradurre questo sito web dall'inglese nella propria lingua locale, utilizzare il controllo nell'angolo in alto a destra della pagina web. 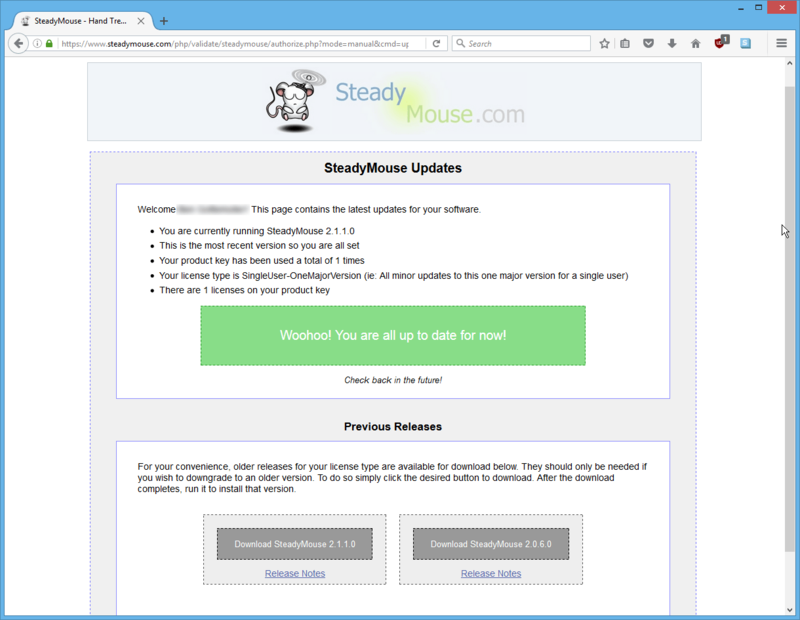 The Reddit forum /r/steadymouse has been created as a place for SteadyMouse users to discuss anything they wish regarding the software. The problems it solves, and ones they wish it would solve, criticism, feedback, etc. is all fair game. Please feel welcome to create a new post or join an existing one. The hope is we will be able to make a small community and the voting there can be useful in showing how important a topic is to everyone. This way, you can influence the direction the software takes next in cooperation with others in the community. We can refine ideas together. SteadyMouse 2 is optimized and elegant under the hood, so that it will run seamlessly on the majority of computers out there with no issues. Apple MacOS (and potentially Linux) support is NOT YET available however work is in progress. You may sign up here to be notified when it is ready. ETA is unknown as this work is extremely difficult. 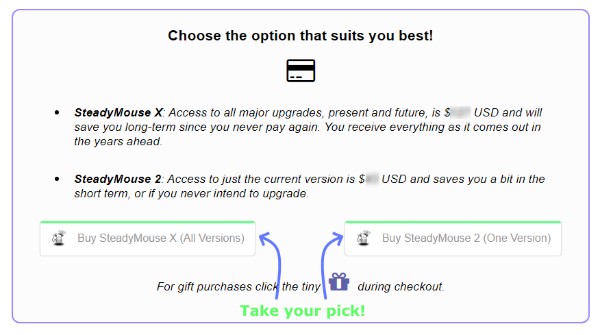 If you purchased "SteadyMouse X (All Versions)", you will have access to it when ready. 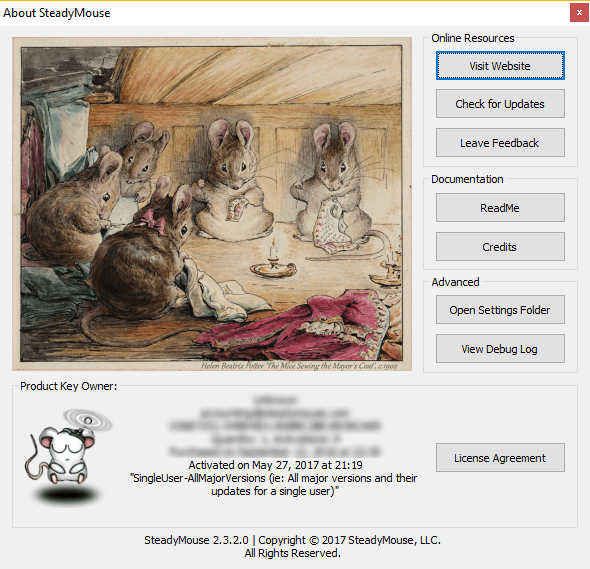 SteadyMouse is designed to transparently work with all common mouse types. Your existing mouse will almost certainly work right out of the box. It is common for laptop users to have both a trackpad and a standard wireless mouse, and both will work fine. It's recommended to experiment with different mice until you find which you like best. Things like the physical weight, optical vs. laser, mouse pad, etc. all can make a positive difference. 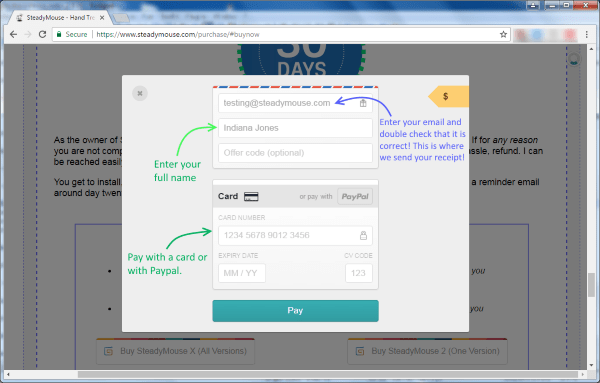 If you have not already bought SteadyMouse, you can do so at the purchase page. Take a glance at the steps below for an overview of what that looks like. First choose the desired license type from the options at the bottom of the purchase page. Next select the quantity of licenses you wish to have. Usually this is just one license per individual that will be using the software. Then click the "Buy This" button when you are ready. A form will appear and you will be directed to enter your email and payment information to complete the purchase process. Take special care to enter a correct email address so you receive a copy of your purchase receipt. If the email to you bounces due to a misspelling or typo, it may result in an automatic refund after a few days. After completing the purchase a pop-up will appear containing both a Download Button and your Product Key. 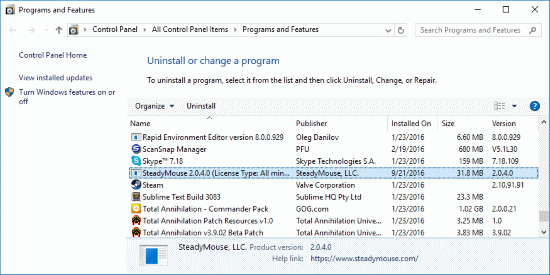 This is everything you will need to get SteadyMouse installed. 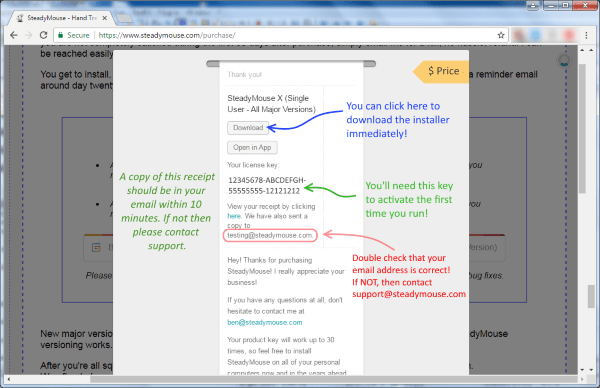 Your purchase receipt email is helpful anytime you need to download a fresh copy of SteadyMouse. It is recommended that you keep this email for the future. 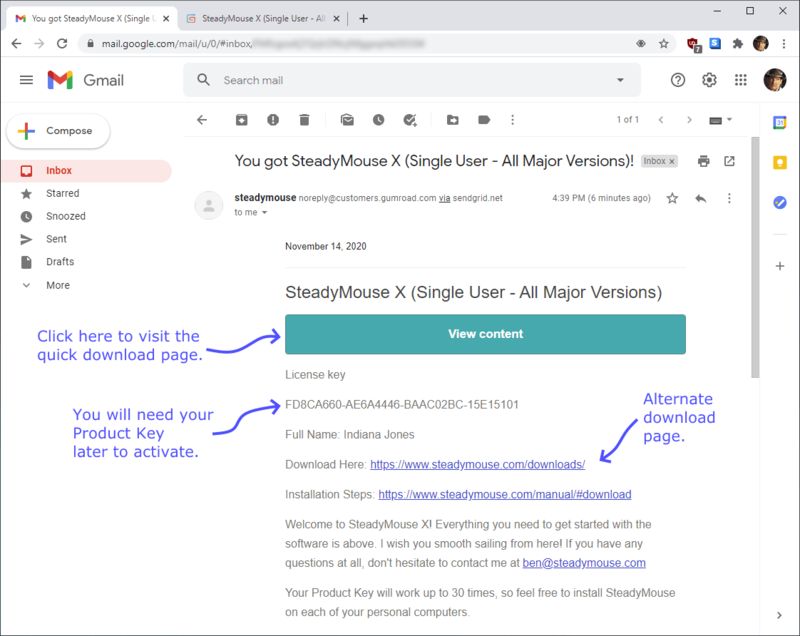 Once you have your purchase receipt email, proceed to the next section to download a copy of SteadyMouse for the first time. Tip: Need an invoice for your purchase? Open your purchase receipt email. There is a "Generate" link at the bottom that will make one for you. 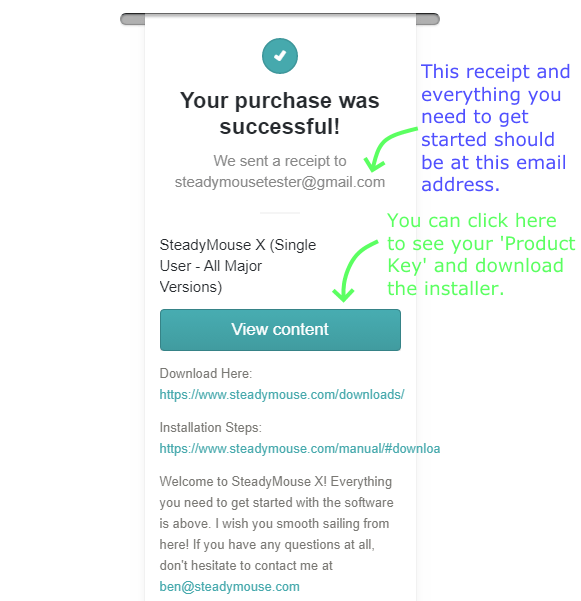 After purchase you should have an email with your SteadyMouse purchase receipt. Open it up and take a look. This email contains everything needed to get up and running. Downloading and installing the setup file is pretty typical. You can see an overview of these steps below. First, notice the Download Button within the email. 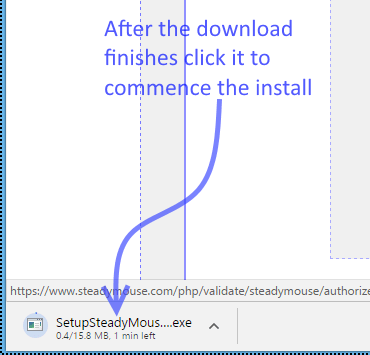 Clicking this button will save a fresh copy of the SteadyMouse installation file to your computer. Also within the email, take note of your Product Key as it will be needed later. A new tab will then open in your browser and the download should automatically begin. Your browser will show the progress of the download either near the bottom, or in the upper right corner. See the blue arrow in the image below for an example of how it normally looks. If you run into any problems downloading, please try again with another browser such as Chrome or Firefox. If all else fails, email support-essential-tremor-filtering@steadymouse.com and we will make sure you are taken care of. You can also try the alternate download method described here. 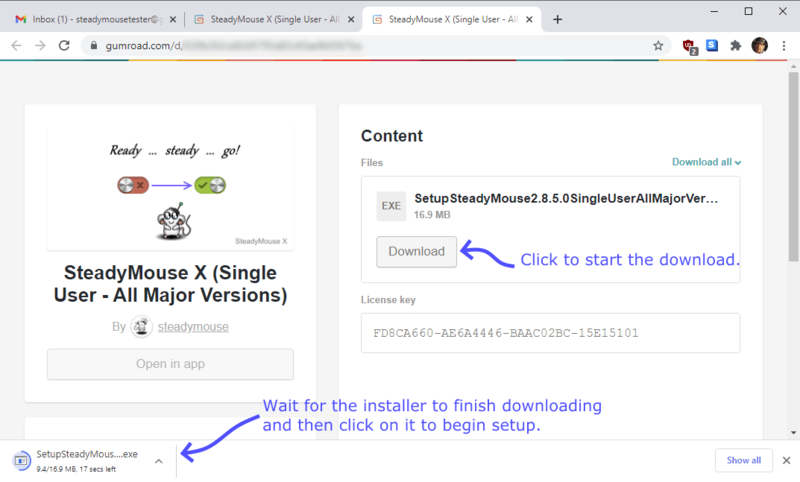 Once your download of the SteadyMouse setup file completes, simply click on it to run the installation. If you do not see anything to click on in your browser, check your Downloads Folder and see if the file is there. 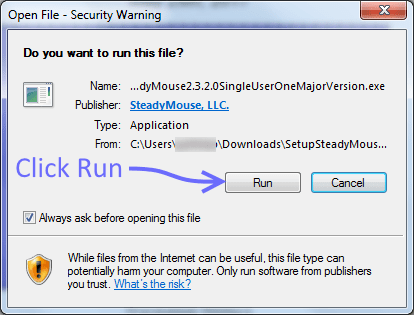 The file name starts with "SetupSteadyMouse..."
Upon running the installer, if a security warning appears, click Run. Click Yes at the "User Account Control" prompt. The installation itself is pretty typical. If you prefer step-by-step instructions, continue to the next section on installation below. NOTE: If double-clicking the installer seems to do nothing see the setup troubleshooting page. If you haven't done so already, double click the SetupSteadyMouse file to begin the installation. The installer should begin to run. If nothing seems to happen see here. Click "Yes" at the UAC prompt. At the welcome screen click the Next button. 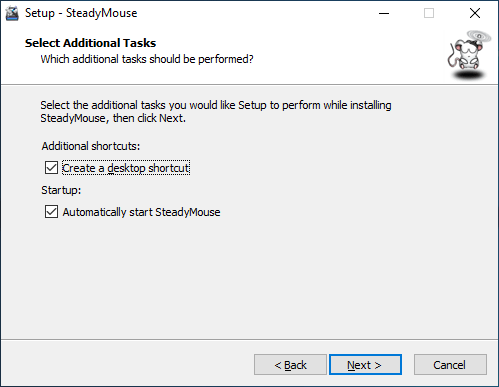 Check or uncheck the box to select whether you would like SteadyMouse to startup automatically every time your computer powers up. Then click Next. You will see a progress bar indicating the installation status. This usually takes less than 30 seconds to complete. 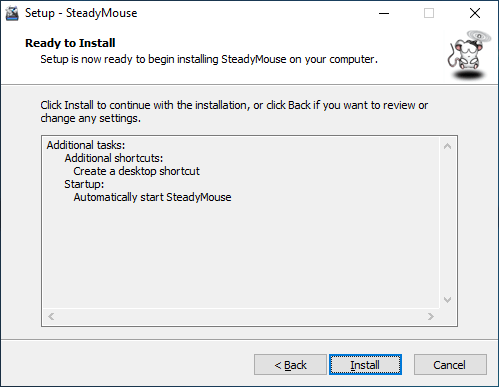 Once installed, you can launch the SteadyMouse application anytime by double-clicking the desktop icon. Woohoo! You are almost there, and just need to use your Product Key to activate now! Continue to the next section on product activation for these last few steps. 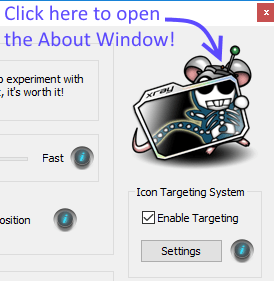 Tip #1: Double clicking the desktop icon AFTER SteadyMouse is ALREADY RUNNING will bring up the settings window. Tip #2: When the application is running it will appear in the system tray in the lower right corner of the screen. You can right click this icon to bring up a menu of options. Activation is a one time thing, per computer, and requires an internet connection just once. You should have a Product Key recieved in your email after purchase. 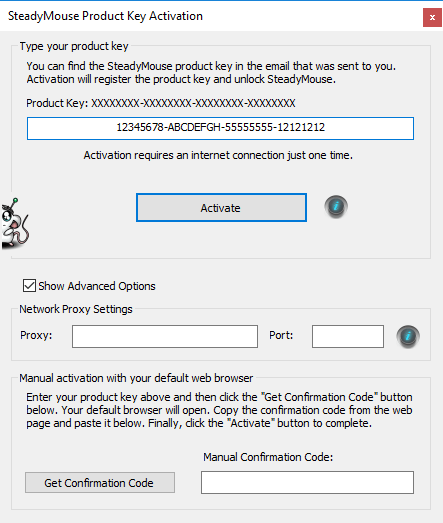 When you run SteadyMouse the first time, it will ask you to activate. Enter your Product Key in the provided field. Optional Step: If you need to go through a proxy server, click "Show Advanced Options" and then enter it. All done! 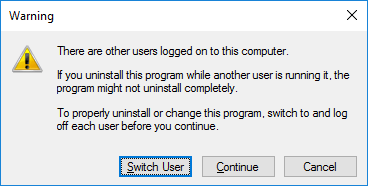 You should never have to activate on this computer again unless you intentionally uninstall the software. Updates that fall under your license are seamless and your activation will automatically carry over from one update to the next. 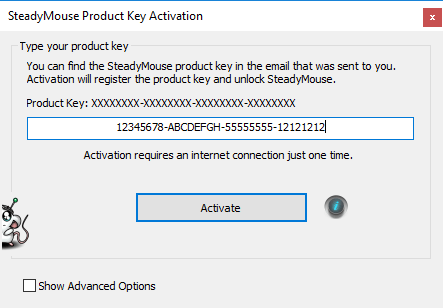 When you run SteadyMouse the first time, it will ask you to activate. Enter your Product Key and then click the "Show Advanced Options" check box. Click "Get Confirmation Code" and your default web browser will automatically launch. A page should then load containing your confirmation code. This uses one activation. Copy and paste the confirmation code from the webpage into the "Manual Confirmation Code" field. Need to activate without an internet connection? It's a little bit more work. Visit here for instructions. For most users, clicking the download button in their purchase receipt email will be enough to get a copy of the software. For cases where this is not ideal, or not working, there is an alternate download method provided. You will need your Product Key. Provided the information entered is valid, you should be directed to the download page. Your SteadyMouse purchase comes with the freedom to install and activate the software on all of your personal computers for personal use (within reasonable limits). In other words, it's expected that a user with several devices, such as a desktop computer in their study and a laptop in the living room, will install SteadyMouse on each of them. This is perfectly fine, as long as it's for the user the license was intended for. The one hard limit is that a given product key will successfully activate up to 30 times (for each user on the key) and no more beyond that. This number is chosen to be more than enough for a user to purchase once and be able to install on all their current computers as well as computer replacements in the years ahead. See the EULA for more details if you like. NOTE: If purchasing for multiple users, you have the option of buying multiple keys or purchasing a single key that has multiple users on it. This can be done via the "quantity" field at checkout. To install on several computers you will simply need the installer and your product key. One easy way is to access your purchase receipt email on each computer you wish to install on. Then run through the Installation and Activation steps like normal. 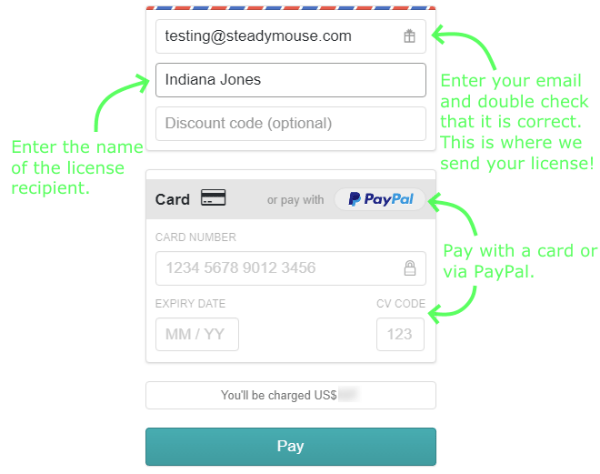 Contact support-essential-tremor-filtering@steadymouse.com and I will issue you a no-hassle refund of your previous license. 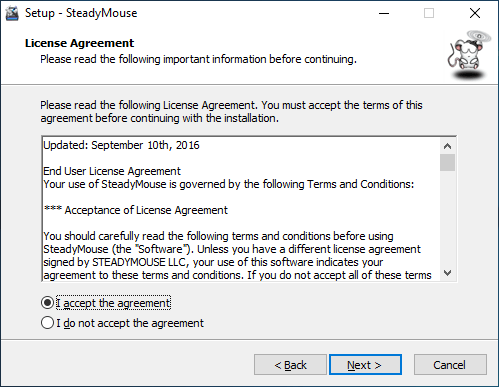 Purchase the license you want on the SteadyMouse website. Run the installer (No need to uninstall the previous version. The SteadyMouse installer is aware of these things). Upon running SteadyMouse the first time after this, the product activation window will open. 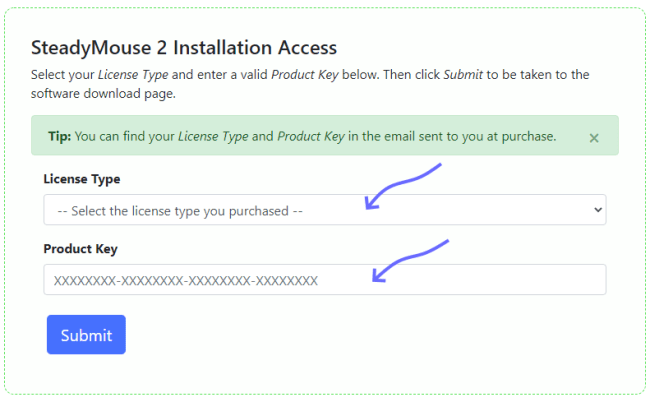 Activate using the product key that goes with that new license type. 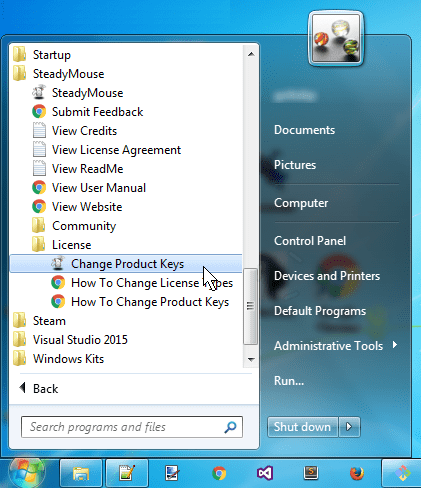 Next, find the SteadyMouse application group in the Start Menu. Click the "License" folder to expand it. 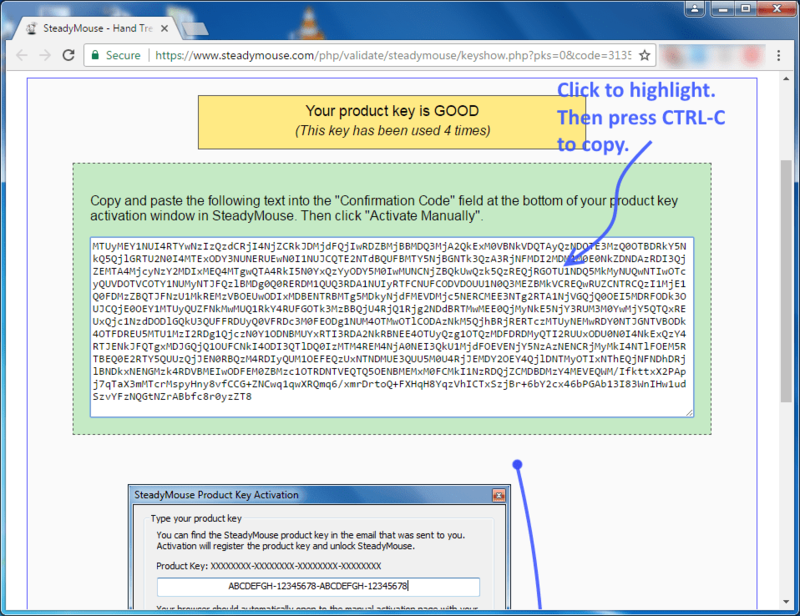 SteadyMouse will launch and open the product activation window. Change keys if you wish. Only click activate if you wish to use an activation! 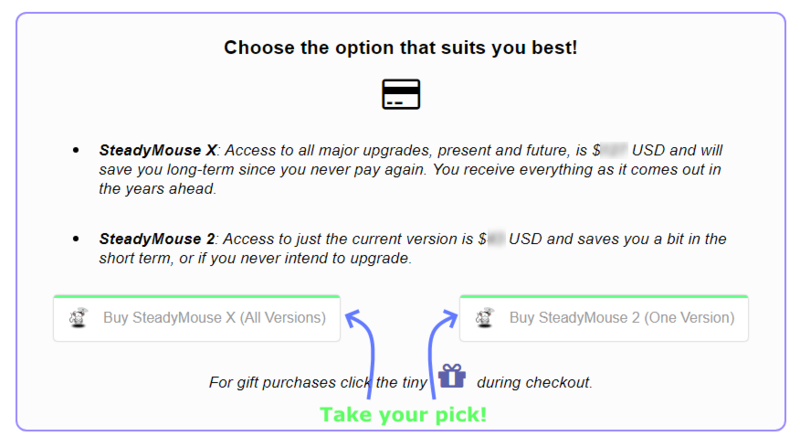 If you change your mind just exit out and the previous activation will be reverted to the next time SteadyMouse runs. SteadyMouse 2 comes with language support for English, Brazilian Portuguese, Danish, French, German, Italian, Russian, and Spanish! Versions released prior to 2.3.2.0 only covered English and Italian, so if you would like the latest language additions be sure to update to the newest release. 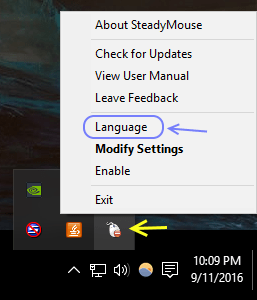 The first time you run SteadyMouse it will ask you to select your language. 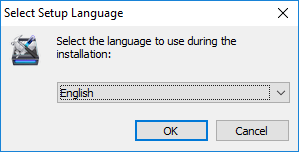 Choose your language and select OK.
You can return to the above window to change the language any time by right clicking the system tray icon and clicking "Language"
Linguistic translation work is always ongoing as new text is added to the software for new and upcoming features. For early access to upcoming language files that are not yet included in an installation, visit the Translation Status page. Interested in contributing a translation in your local language? Visit the Translation Instructions page for details. The first time you run SteadyMouse it will take you through the welcome sequence (one time only). First, you will get a welcome window with a basic overview of features to get you started. After this, SteadyMouse may make a few one-time adjustments to Windows mouse settings. This usually includes turning off "Enhanced Pointer Precision" because it actually degrades precision. The SteadyMouse settings window will automatically be opened for you to explore. Try experimenting with the various controls and clicking the help bubbles to find out what they do! Once you close the settings window, you can always return to it by double clicking the desktop icon. The main settings window in SteadyMouse has all the adjustments you need in one easy to reach place. The controls are grouped into several categories that we will focus on one at a time. 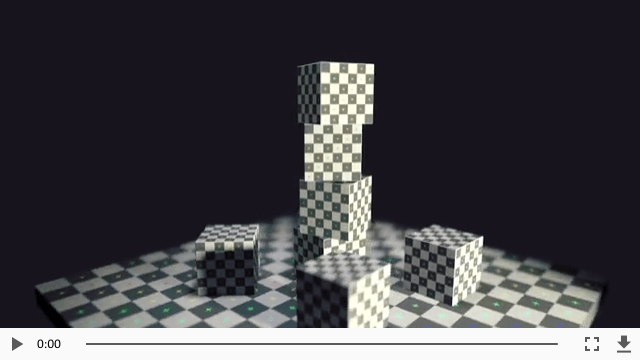 "Anti-tremor Filtering" focuses on removal of shaking hand motion from your cursor. "Ignore Accidental Clicks" functionality focuses on blocking unintended button clicks from getting through. "Icon Targeting" capability focuses on locating the nearest "clickable item" to your cursor and clicking it for you with the double-tap of a "trigger key". "System Toggle Switch" functionality turns all features on and off together, from anywhere. Feel free to experiment and get a "hands on" feel for what each feature does! You won't break it! You can click the "help bubbles" in each section to get the full details on what each control does. If you run into any trouble just toggle SteadyMouse off using the "Num Lock" key (Or whatever toggle key you have set in category #4). Once you are familiar with the basics and ready to go deeper, each of the control categories has its own section in the manual. After you have things to your liking, click "OK" and the window will disappear and SteadyMouse will run hidden in the background. Whenever you wish to return to the settings window, you can access it via the system tray icon in the lower right corner of the task bar. 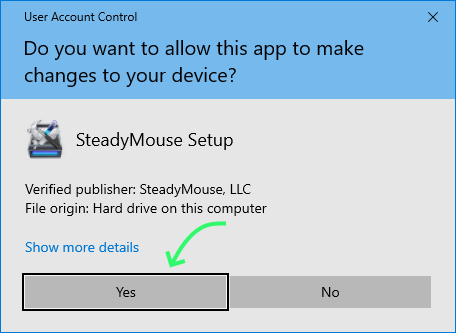 Alternatively, if SteadyMouse is already running, you can double-click the desktop icon to open the settings window as well. When SteadyMouse is running it is accessible via a system tray icon in the lower right corner of the task bar. This icon is a small image of a mouse with either a green '+' or a red '-' depicting whether SteadyMouse is toggled on or off. Double clicking the icon will bring up the configuration window. Right clicking the icon will bring up a menu with various options to change things like language, check for updates, etc (See the image). 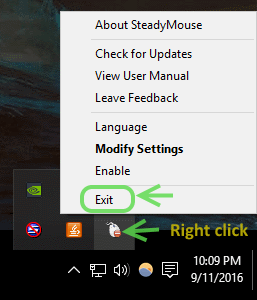 To quit SteadyMouse right click the icon and click "Exit" on the menu. 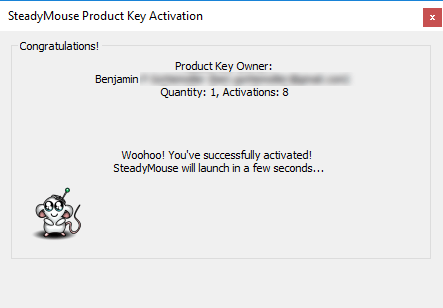 All of the features of SteadyMouse can be switched on or off together using a special system-wide "Toggle Key". This hotkey is especially useful when you want to quickly turn filtering off or back on without opening up the configuration window. The current toggle key setting is displayed in an information bubble shown every time SteadyMouse starts up. Whenever this toggle key is pressed, all of SteadyMouse transitions back and forth between enabled and disabled. You will additionally notice several graphical indicators appear to illustrate the change, and of course the mouse will feel different accordingly. With SteadyMouse 2.4.7.0 and later you can use the toggle key to quickly access the settings window. Simply press and hold the toggle key for at least 3 seconds and then let go. Rather than toggle like normal, the settings window will appear for you. In the old SteadyMouse v1.3, the only option for the "Toggle Key" was "Scroll-Lock". Scroll lock is nice since it's a rarely-used key, and often has a light on the keyboard giving you a visual indicator of the status, however many newer keyboards do not have it. With SteadyMouse 2.6.3.0 and later, "Num-Lock" is now the default toggle key. It is also configurable in settings and via a prompt the first time the software runs. If your keyboard does not have the Num-Lock key please select a different option. To change your system-wide toggle key, open the SteadyMouse settings window and click the "On / Off Control" Settings button on the right hand side. The System Toggle Settings window contains a drop down list with several alternative toggle key(s). Select the desired key combo and click OK. This key-combo can be pressed anytime, from anywhere, to toggle all of SteadyMouse on and off. 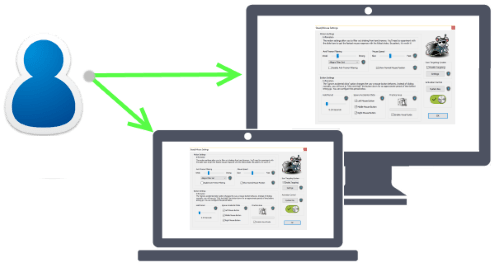 At the core of SteadyMouse is the anti-tremor filtering system that removes the shaking hand motion from your mouse cursor. Here you can see tremor removal in action as we toggle the system between on and off. When toggled off the cursor is all over the place. When toggled on a tiny crosshair-dot shows the chaotic raw mouse motion while the cursor itself becomes smooth and steady. In the settings window you will find a powerful slider-bar to adjust the strength of this filtering. As you drag the selector to the left, the mouse gets snappier however tremor begins to seep through. As you drag the selector right, the tremor removal gets really good, however lag increases. Experiment to find the weakest setting that still removes the shake. Adjacent to the filter strength slider, you will also notice the traditional mouse speed control is present. It is recommended that you keep the mouse speed within the illustrated green rectangle for best results. Above the half-way point especially, Windows scales the cursor motion in a way that loses precision and contributes to a wobbly feeling. As a general tip to make life easier when adjusting slider bars, you can click on the general area of the bar and then proceed to use the left and right arrow keys on your keyboard to make fine tuning adjustments. Tap the left arrow to move the slider left and tap the right arrow to move right. If you find yourself space constrained, an extra large mouse pad is recommended to give you ample freedom to move the mouse about. Ready for more advanced instruction? Read about Filter Sets and Filter Tuning below. The tremor removal system contains multiple filter sets that significantly affect the feel of the mouse. Some sets are very snappy (eg: Feather and Classic). Other sets are very smooth but with more lag (eg: Adagio). By experimenting you can find the filter sets that work well for you. Be sure to try various filter strength slider bar adjustments for each filter set. The sweet spot is not always the same from one to the next. Allegro - This is the default filter set, with a nice medium balance between tremor removal and cursor snappiness. Adagio - This is a heavier filter set, less snappy than others yet powerful enough to handle the worst of tremors with class. Classic - The original filter set from SteadyMouse v1 with a wide range going from snappy to decently heavy. It's an oldie but goodie! Artistry - Great for drawing pretty lines and curves in Photoshop. Laggy - The most insanely heavy filter set in the arsenal, designed for magnitude 10 earthquakes and beyond. Experimental - Used for trying new things and will periodically change. If feedback is good, it becomes an official new choice. When bad, it gets replaced. Adjusting the anti-tremor filtering settings takes some experimenting. The goal is to find the weakest filter setting that still removes the tremor motion. This will give you the snappiest cursor response while keeping the mouse under control. For now, set your mouse speed below ten percent or less. We'll increase it again later. Set the filter strength around 95% and observe if any tremor gets through. The mouse will feel like it's in molasses but should at least be smooth. Try different filter sets until you have one where there is not any tremor getting through. Any filter set that fails to remove your tremor near maximum strength is not worth tuning. Move on to another one. You want to have some room for adjustment. Some recommended filter sets in order of preference are "Feather", "Allegro", "Adagio" and "Classic". "Feather" is very snappy but may not be strong enough. "Adagio" is very very strong but can feel laggy. "Allegro" is in between. "Classic" has a wide range between snappy and heavy. Choose the snappiest filter that removes all of your tremor. Once you have found a filter set strong enough for you, it's time to back off the filter strength to get some responsiveness back. Begin decreasing the filter strength until tremor starts getting through again. Then raise it just a little. Now raise the mouse speed bit by bit until you're happy with it. As you do this, some tremor may begin to get through again. When this happens, you can either bump the filter strength a bit more to compensate or back off the mouse speed. TIP: It's recommended, regardless of tuning settings, to stay below 50% on mouse speed. Windows throws away accuracy by upscaling when above that mark. Lastly, feel free to try both a light weight mouse and a weighted mouse. The former lets SteadyMouse do all the filtering and the latter lets the mouse absorb some of the tremor. The jury is still out on which is best. 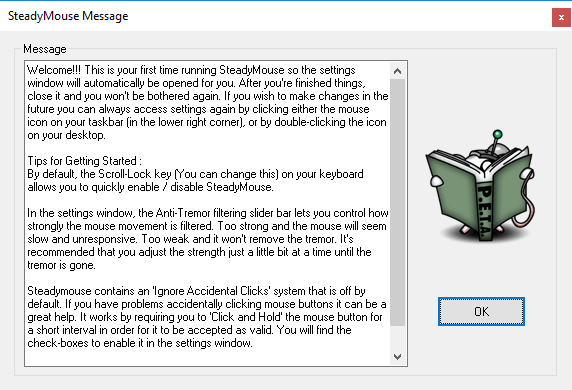 SteadyMouse contains an advanced system for ignoring unintentional mouse clicks. If you find your fingers constantly hitting the mouse buttons during use, then this feature can help out quite a bit. The "Button Settings" group in the settings window contains all options for ignoring clicks. Check the box for each mouse button that has been causing trouble. Now try clicking and notice that nothing happens! Fast clicks are blocked! Alright, great you say, but how do I click when I actually wish to? Rather than just tapping to click like normal, try holding the button down just a little longer. If "Enable Visual Guide" is checked when you do this, then you'll see a nice indicator appear next to your mouse cursor. Here's an example, where you can see the user first clicking rapidly, then clicking for too long, and then hitting the sweet spot at which point the right-click menu appears. The visual indicator behaves a bit like a stop light. If you press and hold a button the indicator will appear and start to change. To have a click get through simply let go when the indicator turns green. Clicks that get released when the indicator is yellow or red get ignored. The one exception to the above is the left mouse button which behaves only slightly differently. The left mouse button is unique in that it must support both double-click and click+drag capability. When "Ignore accidental clicks" is enabled for the left button, you still click-and-hold a tad bit longer, however as soon as the "hold period" is reached (ie: When the indicator goes green) the down-click occurs. 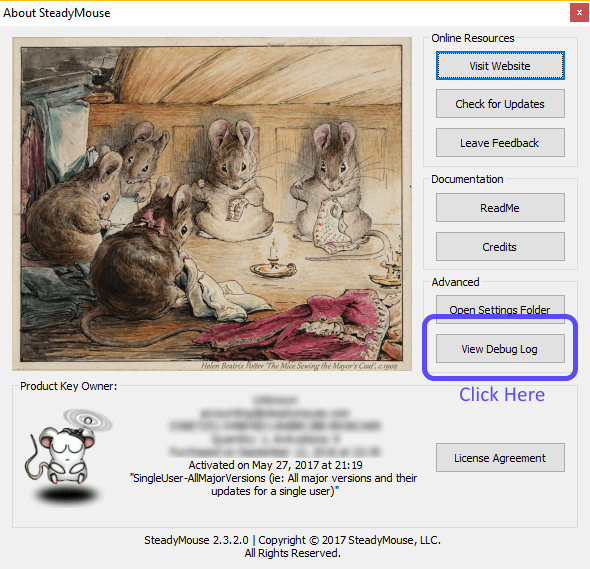 SteadyMouse holds that down-click until you release the button to allow click+drag capability. Additionally, two back to back left clicks become a double-click. Sometimes experimenting is easier than explaining. Try it out and you'll get the hang of it pretty quickly. Within half an hour it will be second nature. PRO TIP: Set the "hold period" to the smallest value that works for you. For many users, accidental clicks are very rapid, and a "hold period" between 0.1 and 0.2 seconds works very well. When it's set that low, you'll barely notice the system anymore and your intentional clicks only have to be the tiniest bit longer than the accidental ones in order to get through. It'll be like the old days before this was a problem. The "Icon Targeting System" is the "pull" whereas the filtering system is the "push". They both work together to boost your productivity. With Icon Targeting it's possible to move very fast once you become proficient at using it. It works by constantly scanning for clickable content on your screen. After locating buttons, check boxes, icons, etc. it highlights the item nearest to your cursor, placing a spinning target over it. A simple double-tap of a trigger key (configurable) then snaps your cursor to that target and automatically clicks it for you (or holds the cursor so you can click). To enable Icon Targeting, check the box on the right side of the settings window (Just a warning, this does require a bit of CPU). If you click the "Settings" button then the "Icon Targeting Settings" window will open. Here you can configure what key will trigger snapping the cursor to the closest target and whether, upon getting there, it clicks for you or holds the cursor in place briefly. Notice the triangular target above the OK button in this example. That's what the nearest target looks like. All the user needs to do is get their cursor close enough to a target and double-tap the trigger key. No need to be right on it anymore. The target actually grows and shrinks based on the distance of the cursor from it, and in relation to the icon size itself. Finally, the system has recently gained experimental ability to target URLs in web pages. This is currently only available in Firefox and Microsoft Edge. Chrome unfortunately does not work at this time as it fails to return meaningful information when asked by the scanner. Note: If you get a little popup in FireFox saying accessibility is temporarily limited, see here for a workaround. 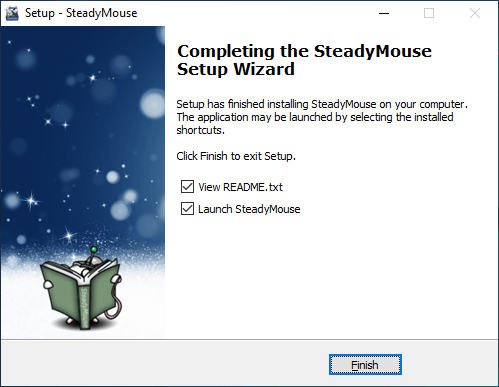 SteadyMouse contains experimental settings to support use in games. It can be setup to provide tremor removal or alternatively to create a high precision, responsive, yet beautifully smooth, mouse signal for competitive performance purposes. SteadyMouse can be used as a steadicam for active camera stabilization in conjunction with 3D modeling software. SteadyMouse contains a handful of visual effects to give helpful cues at just the right times. The "Ignore Accidental Clicks" visual indicator helps guides you when making a valid click. The help bubbles provide background information and tips on each major control. The dynamic target effect shows you the nearest clickable item you can snap the cursor to. Screen overlay bubbles notify you of major status changes, like toggling the SteadyMouse system state. 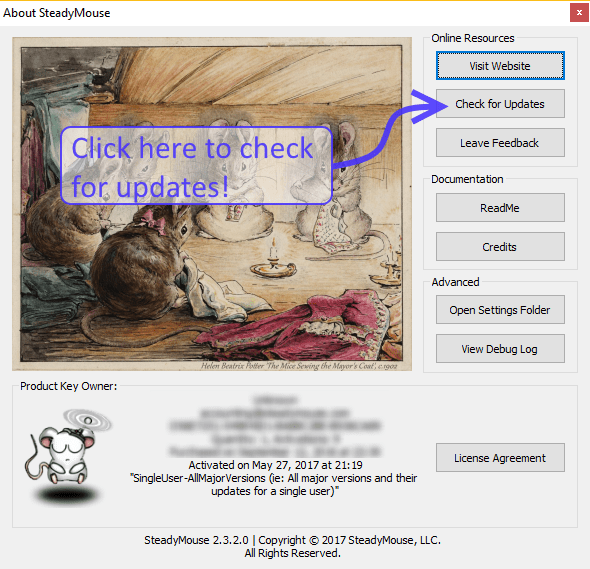 SteadyMouse contains an easy way to check for new updates. Access to new versions is built right into the application, so all it takes is a few clicks. With SteadyMouse already running, double click the desktop icon to bring up the main settings window. From the SteadyMouse settings window click the little mouse cartoon in the upper right corner. This will open the "About Window"
Once the About Window is open, click the "Check for Updates" button on the right hand side. The settings window for the periodic update reminder will appear. Click the Check Now button. 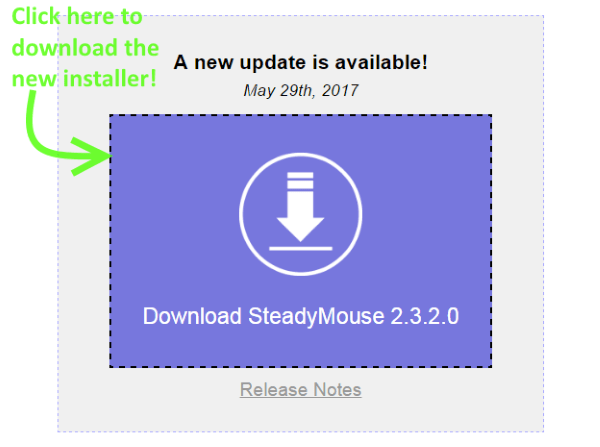 If an update is indeed available, click the big "Download SteadyMouse" button to begin downloading the new installation file. After the file is finished downloading, simply click on it to start the installer. When the browser security warning appears, click Run. Click Yes at the User Account Control prompt. Run through the installation steps like normal and you are all set! If desired, you can find more detailed instructions regarding the installer steps in the install section of the manual. Your settings and product-activation are automatically preserved from update to update. Note: An alternative way to "Check for Updates" is available by right clicking the system tray icon (See the green arrow in the picture below). This icon is found in the lower right corner of your desktop. A menu will appear and then from there you can click "Check for Updates" (See the blue arrow in the picture). 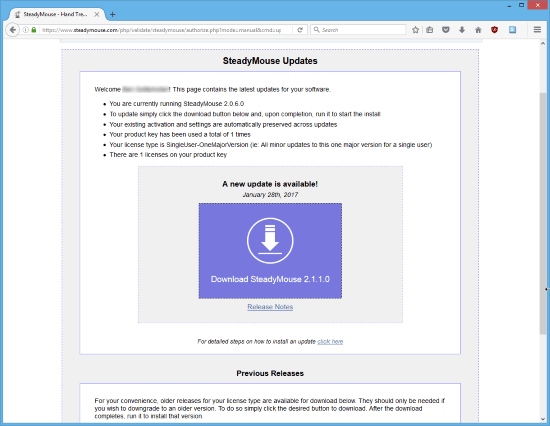 All SteadyMouse 2 (and later) licenses come with access to minor version updates and bug fixes. The high end license includes access to major versions in addition to all the rest. SteadyMouse version numbers take the form "A.B.C.D" where A is the *major* version number and B, C, and D are *minor* version numbers. 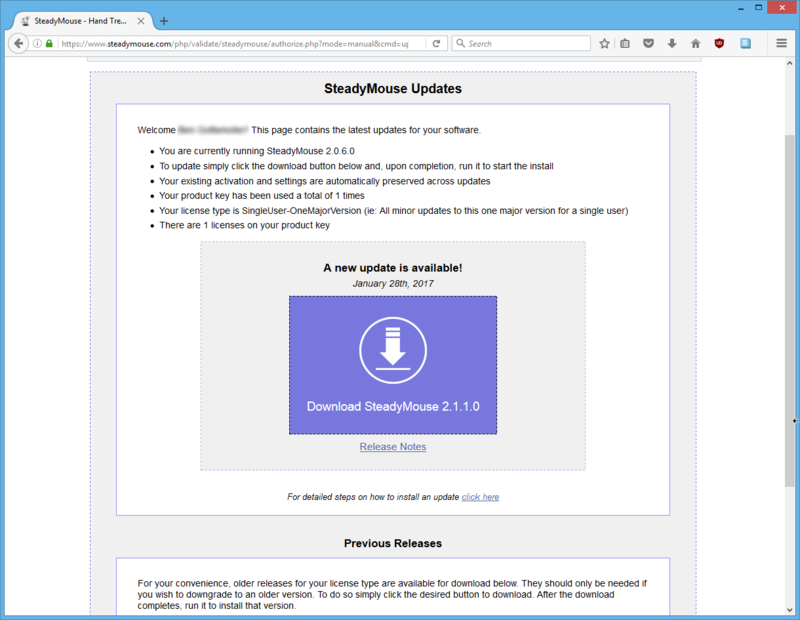 For example: SteadyMouse 2.4.7.0 was released on December 24th, 2017. The version of SteadyMouse can be seen at the bottom of the "About" window within the application. Changes to 'A' will happen upon major additions of new features, occuring approximately once or twice a year. Changes to 'B' will happen upon significant updates to existing features. Changes to 'C' occur upon any bug fixes and minor tuning changes. The meaning of 'D' is still up in the air. In short, minor version numbers get bumped for any bugfixes and small improvements to existing features, and every customer has access to these. Due to the great diversity of Windows configurations in the wild, SteadyMouse occasionally encounters rare and difficult problems. Due to the detail sometimes necessary, there is a dedicated troubleshooting page with background, workarounds, and fixes. SteadyMouse contains a highly detailed debugging log that can be consulted if any bugs or anomalies are noticed during operation. 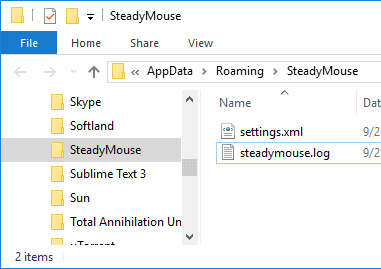 To access this debug log, first open the "About" window by right clicking the tray icon (in the lower right corner) and selecting "About SteadyMouse"
Then click "View Debug Log"
The log file will automatically open in your default text editor. The information is in chronological order with newer entries appended to the bottom and older entries towards the top. The log file can be a tremendous help with debugging if you are open to sharing some or all of it. With that said, the file is YOUR data to do what you want with. It is never automatically sent anywhere unless you choose to do so manually. To exit SteadyMouse, right click the system tray icon in the lower right hand corner of the scren. Then click "Exit"
If the application is unresponsive or you need to force SteadyMouse to close without using a mouse, see the force quit section of the manual. In the rare event of a major problem with SteadyMouse, such as disappearance of the cursor, or loss of filtering, you can force it to shutdown by holding down the left and right arrow keys on your keyboard for 5 seconds. This will cause SteadyMouse to attempt a graceful exit first and if that fails (after about 4 seconds) it will attempt a non-graceful shutdown. Note: Prior to SteadyMouse 2.6.3.0 it was necessary to hold all four arrow keys to accomplish this (Up, Down, Left, and Right). If such a scenario ever happens where you actually need this, please email support-essential-tremor-filtering@steadymouse.com so whatever caused the problem can be fixed. SteadyMouse 2 contains many experimental settings that are not yet presented by the GUI. Savvy users are welcome to explore, while keeping in mind that experimental features may not be ready for prime time just yet. To access the user settings file, first open the "About" window by right clicking the tray icon (in the lower right corner) and selecting "About SteadyMouse"
Next click "Open Settings Folder"
Open settings.xml in your favorite, UTF-8 capable, text editor. I really like Notepad++ if you need one. Prior to editing the settings.xml file, exit SteadyMouse as otherwise your changes will just be ignored and overwritten. The settings.xml file will look like this, and exposes a huge number of options that you can read through. Most settings have guiding comments. Change whatever you'd like, and then start SteadyMouse again to pick the changes up. Keep track of your changes so you can revert anything that doesn't work as you like. Also, I don't recommend messing with the license or activation sections as you can end up needing to reactivate if something gets messed up. 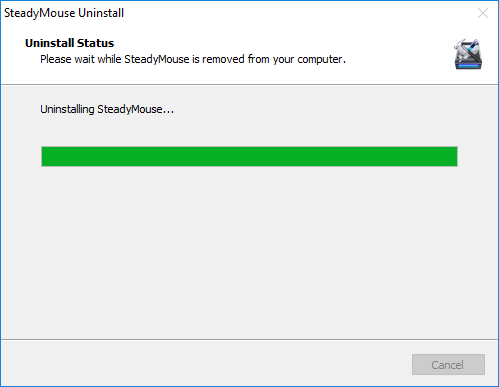 Uninstalling SteadyMouse is just like any other program. 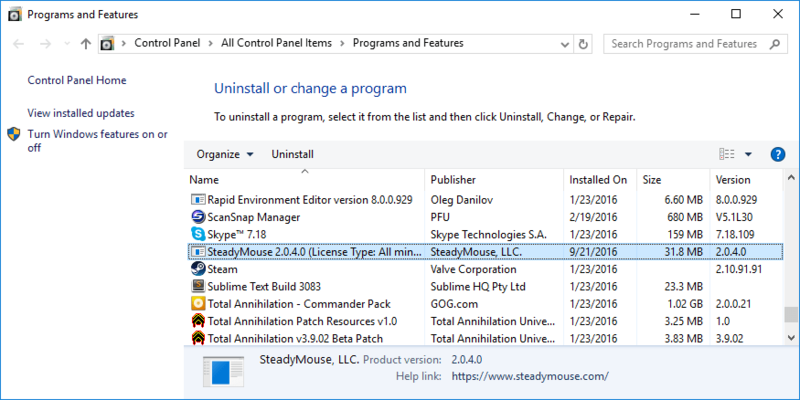 Find SteadyMouse 2 in the list and click "Uninstall"
It will ask for confirmation that you are sure. When it asks about deleting settings I usually recommend clicking "NO" as otherwise, the activation will get deleted and have to run again if you ever choose to re-install. On the other hand, if you are trying to switch to a different license key, then click "YES" here and all settings, including the last activation, will be removed. 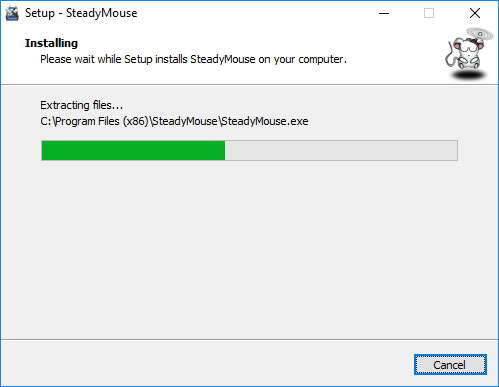 Click "OK" and you are done removing SteadyMouse. The refund policy is designed to let you take the latest SteadyMouse software for a spin with full assurance it will be worthwhile. In short, you will find your mouse experience greatly improved or you will get your money back. Yes, you are allowed to install and activate AND still get a refund if you choose. 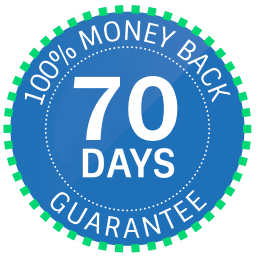 You can have this refund for ANY reason at ANY time in the first 70 days. We'll send you a reminder email around day twenty-five so you don't forget to make a decision. To initiate simply send an email, from the email address you purchased with, saying "Please refund". That's it. Your full refund receipt will arrive within 24 hours. Easy peasy! SteadyMouse, LLC. pledges that this will be a no hassle experience. Companies that give people the run-around are terrible! If you feel inclined, tell us about your experience. Feedback drives change. Outside the 70 days? Send a note explaining the situation and we'll work something out.